VaultPress accounts can have many users, but they have only one owner. Only the owner of the VaultPress subscription can add or remove other users and manage the billing information for the subscription. For the owner, it’s best to use an email address that is actively monitored by the person using the account, and that can send and receive emails. 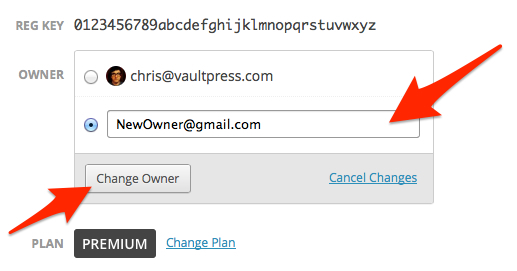 Add the new user’s email address where indicated, and they’ll be added to your VaultPress subscription. They will then be able to view, download, and restore your backups, and, if you are a Premium subscriber, they can view and manage your security notices. Note: All VaultPress users must have a WordPress.com account. If a user you plan to invite does not have a WordPress.com account, they can easily sign up for one for free here. The current owner of a VaultPress subscription can transfer ownership in just a few steps. Please note that this will not work for Jetpack plans. First, log into your VaultPress dashboard and head over to your Account page. You’ll see a “Change Owner” link next to your email address. Click that, and you’ll see a list of all the site’s current users and an option to add a new user. Once you’ve changed the owner, any billing information on file will be removed, and the new owner will be sent an email and asked to enter a new credit card. After ownership has been transferred, you’ll still have access to the site’s VaultPress dashboard, but not to any billing or plan details. Note: The information about changing current owners applies to VaultPress subscriptions only. If you have a Jetpack subscription please cancel and resubscribe to the plan from the new owner’s WordPress.com account. Email notifications, including warnings about connection issues, will always be sent to the account owner. All billing-related emails will go to the billing email on file. Any emails about successful or failed restores will go to the email address of the user who logged in and started the restore process.